When you take pictures at an aquarium, it's usually (but not always) necessary to use flash due to the low light environment. On-camera flash is problematic because of the reflection. Therefore, you have to take the flash off the camera and hold it to the side. The only way it can be used on-camera is if the lens is placed against the glass or Plexiglas of the aquarium. It is best to do this with a rubber lens hood to prevent scratching the aquarium and the lens, but by doing this the reflection from the flash won't be able to bounce back into the lens. Alternaitvely, you can raise the ISO until the shutter speed is fast enough for a sharp picture. That's what I did here. However, the lens still has to be up against the glass or Plexy because that eliminates reflections of objects behind you. 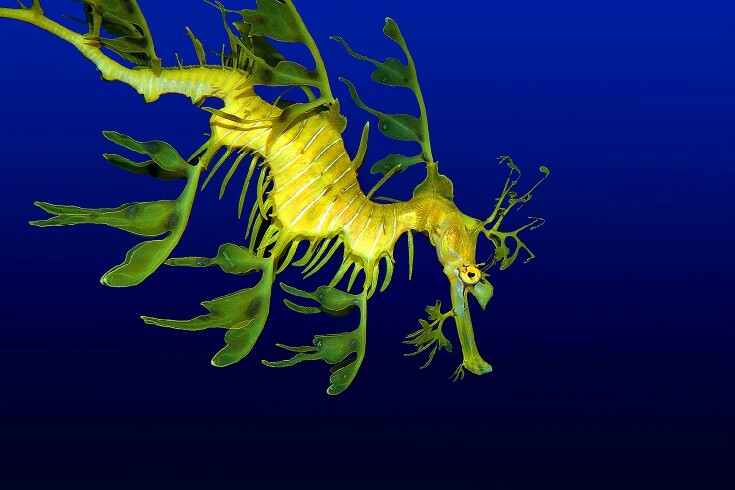 The settings for this picture of a leafy sea dragon were 50mm macro lens, 1/125, f/7.1, 800 ISO, hand held.